Yashi is the Japanese word for palm tree, where this raffia fiber comes from. Knit or crochet, raffia is interesting and fun to work with. 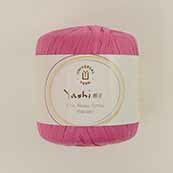 From hand bags, hats, and home décor, you'll enjoy this unique yarn and the items you create with it. Hand wash in cold and dry flat, if needed. See Yashi varigated colors here.